Cherry Berry : I Joined Expedia World on a Plate Challenge! I Joined Expedia World on a Plate Challenge! Due to hubby's health condition, I have been preparing healthier food options these days. I even went to the extent of buying a gas-fired oven so that we could avoid deep fried dishes that are high in cholesterol. My family have been enjoying all things grilled, from vegetables to fish and meat. I have to say I've purchased the best kitchen toy to date. Apart from grilled dishes, another healthier food option my husband enjoys eating without having to worry about calorie and cholesterol count is fresh salad. When I received an invitation to participate in Expedia World on a Plate Challenge, I decided to come up with a salad dish. If you've heard about Expedia's Package Holidays, you'll know that there are many countries to choose from. My choice for the challenge was Cyprus. "Why Cyprus? ", you may ask. Well, I gathered that Cyprus have rich history in gastronomy with indigenous products and unique recipes that cannot be found anywhere else. Have you heard about Halloumi, Pastelaki, Lountza and Carob? They are just a few of Cyprus' amazing wealth of ingredients. I got really intrigue with Carob that I wish to try it with my fresh salad recipe. Place it in a small jar, cover tightly and shake to form the dressing. Set aside and keep refrigerated until required. To make my salad recipes even healthier, I avoid fatty salad dressings and opt for a freshly concocted salad dressing. Place it in a salad mixer and rotate its cover until the vegetables are evenly mixed. 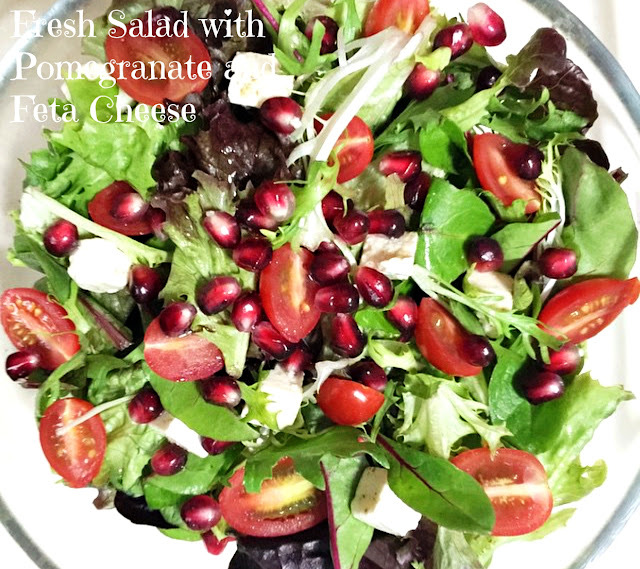 Put the mixed vegetables in a salad bowl and garnish it with feta cheese with herbs and fresh pomegranate seeds. Ultimately, drizzle your preferred salad dressing and enjoy! There goes my Expedia World on a Plate Challenge! Would you join the challenge too? What would you cook? I love salad, I can survive for a month or two eating just that. Thanks for the recipe! wow! i would love to join the challenge!!! im thinking of cooking beef caldereta! and i will prepare fern salad!!! We're up to challenge of eating healthy food as well. We stop eating process food and more of organic veggies and fruits quite pricey but in a long run its a good health investment. Grilled foods, not into it but salad, wow! type na type. I'll let my wife try your recipe. Seems yummy . salad is my to go food whenever I am lazy to cook, thus it is the most prepared dish at home :) haha! That's a very good looking salad you have there Che. Your salad sure looks colorful, healthy and delicious! To be honest, this is actually the first time I heard of the Cyprus ingredients you mentioned.